Defenders Greg Harnett and Tyler Burton have officially earned a C-note, playing their 100th NLL game Jan. 12 against the New England Black Wolves. “It feels really good actually,” Harnett said prior to the tilt. “I had no idea until I was told. To be honest with you it all goes by really quickly, looking back I’m like ‘oh my gosh, 100 already’ – It’s exciting. Harnett was selected 11th-overall by the Roughnecks in the In 2011 Draft. He’s played almost eight seasons with the club since. The 28-year-old has been with the franchise for nearly a third of his life, and yet, he can still recall his first NLL game like it was yesterday. Harnett would go on to earn an alternate-captain position with the Riggers, scooping 268 loose-balls, causing 59 turnovers, and tallying 29 points (10g, 19a) in his career. The rough-and-tumble defender also sits in the top five in franchise penalty minutes with 193. As for Burton, his path to the NLL – and eventually the Roughnecks – was a long and winding one. Passed over in the 2010 Draft, Burton was unwilling to take no for an answer. He signed his first NLL contract shortly after, and played 14 games with the Knighthawks in 2011. He’d go on to win two NLL Championships with the team (2012, 2013). And then the injuries came. 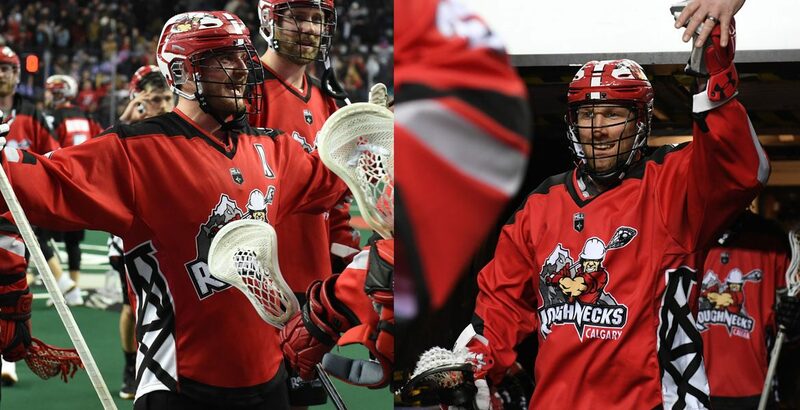 From 2014 to 2015, Burton bounced around after a stint on the injured reserve with Rochester, moving to the Edmonton Rush practice roster, and then to the Vancouver Stealth in 2015. Finally, he penned a contract with the Riggers in 2016. Since then, he’s scooped 269 loose balls, caused 51 turnovers, and taken 1,124 face-offs for Calgary (594 of which he has won). Now in his ninth NLL season, there’s only one thing he’d change looking back. “I wish I had taken care of myself better when I was younger,” he said. “I could have overcome my injuries a lot quicker if I had. One hundred games down, plenty more to go. The pair has a few goals in mind moving forward. “Number one on my list, I want an NLL championship,” Harnett added.